Four IDF soldiers from the Golani Brigade's Battalion 13 were sentenced to military prison Friday for wearing t-shirts protesting the use of soldiers to expel Jews from their homes in Judea and Samaria during their graduation ceremony Thursday, the IDF spokesman's office says. 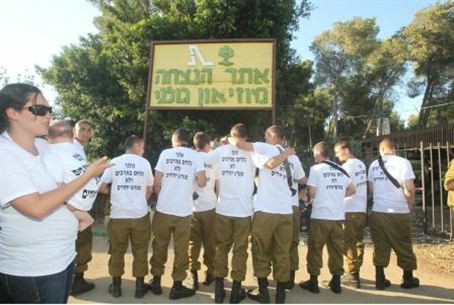 Following the ceremony, in which the soldiers received their brigade's beret, signifying the end of their training, a number of soldiers removed their uniform shirts to reveal t-shirts they had printed. The soldiers, and their parents who attended the ceremony, represented both religious and secular communities in Israel. "Golani fights enemies and don't expel Jews," she shirts read. Photographs of the soldiers wearing the custom shirts were distributed to the media without their knowledge, Army Radio reported. "The Defense Minister and senior political officials need to take stock of how they deploy soldiers. Using soldiers to expel Jews from the settlements instead of fighting the real enemy leads people from all corners of the population to declare not to give them these kinds of tasks," it said in a statement. The Golani Bridage has an established history of staunchly objecting to such orders. During the 2005 expulsion of Jews residing in the Gaza strip senior IDF officers became so concerned the elite brigade would refuse orders en mass that plans to use it in the destruction of Jewish communities were scrapped. “The sentiment of the commanders in the brigade is that they are being forced to choose where their loyalties lie – with their father or with their mother. It's an impossible choice between settlement in the Land of Israel and the IDF,” the Deputy Battalion Commanders had said at the time. The brigade was instead deployed to conduct counter-terror operations in the region.